Wow! Look closely at this amazing image. What is it? Clearly [???] it’s an Ottoman calendar from a century ago. Fortunately, it has been annotated for our viewing pleasure. 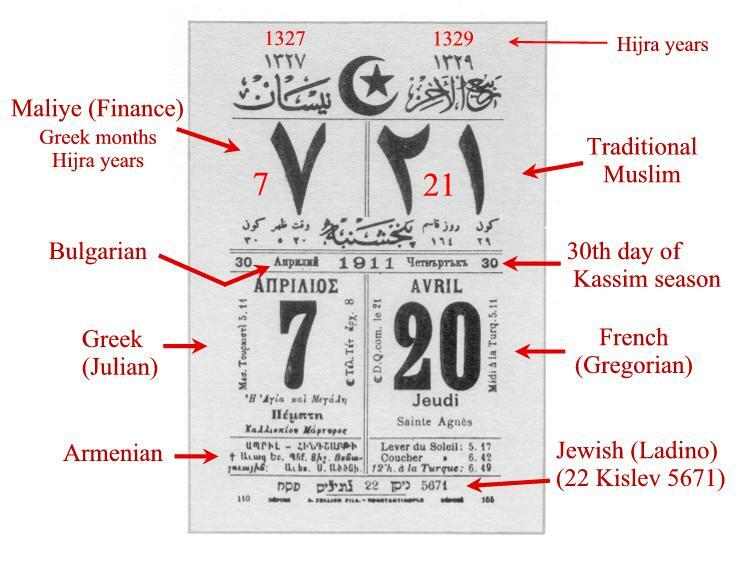 It shows the then current date — apparently April 20, 1911 — in a variety of calendars from different religions and ethnicities. There’s a lot that I don’t understand about it, even with the helpful annotations. But let’s see what we can observe in the lower half. First, we see that the Greek says Απριλιος, which clearly means April. The day is either the 7th or the 20th, 7th in the Julian calendar and 20th in the Gregorian; so far so good. In French and Greek we see that it’s Tuesday the 20th, and the French gives us times for sunrise and sunset. Above and below are some unreadable remarks in Bulgarian and Armenian (unreadable by me, at any rate, although I can identify the languages from their alphabets). OK, now let’s turn our eyes to the upper half. We see the numbers 7 and 21 in traditional Arabic numerals, and at the very top the numbers 1327 and 1329, also as glosses of the Arabic. (A brief aside: many people call the numerals we commonly use today “Arabic numerals,” but they are more properly Hindu-Arabic. They came originally from the Hindus and were transmitted to Europe by the Arabs. You will notice that the 2, 3, and 7 above look quite different from our equivalent modern numerals; that is because the major achievement of the Hindu-Arabic numeration system is not the shape of the glyphs but the fact that it is strictly base 10, including the zero that had eluded so many cultures including ancient Greece and Rome. End of digression.) The Hijra years (now usually transcribed as Hijri, not Hijra) are in the Islamic calendar, marking the number of years since the Hegira. I have no idea why there are two years at the top, 1327 and 1329, but if we add 622 (the year of the Hegira) we get 1949 and 1951, which don’t seem to be much help if the calendar is from 1911. But wait! As we all know, the civil (or Christian) calendar doesn’t have the same number of days as the Islamic one. That’s why Ramadan occurs at different times of our year. So, if we use the conversion formula 0.970229 × y + 621.5643, we find that the year is indeed 1911, as expected. All right, I’m exhausted. I’ll leave the rest as an exercise for the student.